Valentine’s Day is only ten days away. 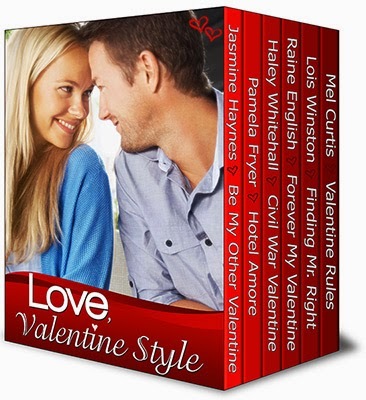 What better time to remind our readers of Love, Valentine Style, a very special holiday anthology of novellas by six bestselling and award-winning authors. Whether you’re sharing the day with someone special or still in search of that special someone, take a break and lose yourself for a few hours in Love, Valentine Style. You won’t be disappointed. In this mini-sequel to the award-winning Hooking Mr. Right by Lois Winston (writing as Emma Carlyle,) editor Grace Wainwright, has taken over the role of bestselling author and romance guru Dr. Trulee Lovejoy. Thea Chandler, the original Trulee, is now married to her Mr. Right and is a successful cookbook author. She and Grace host the top-rated Love Recipes cooking show. When producer Becket Delaney announces the first two shows in February will have a Valentine’s Day theme, Grace freaks out. The worst day of her life occurred on Valentine’s Day ten years ago, and she wants no reminders of it. Definitely gets me in the mood for Valentine's Day! Congrats on your new book bundle! Looks exciting!